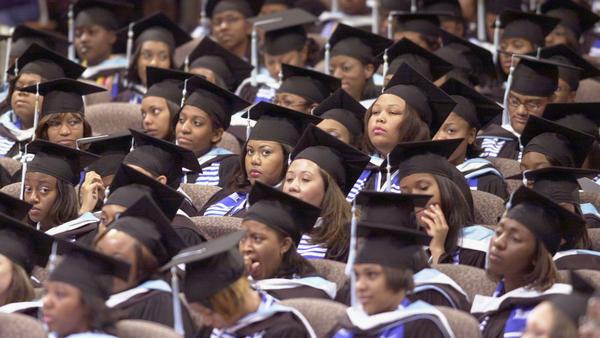 Graduates of Spelman College during commencement ceremonies on May 19, 2002. Rising tuition and increasing student debt have called into the question the value of the arts and humanities on many college campuses. At Spelman College, a selective, historically black women's college in Atlanta, one particular cut has come as a surprise to some alumnae: the elimination of the college's once esteemed jazz program, a rarity in a heavily male-dominated artistic field. "We're talking about a historically black college," says saxophonist Tia Fuller, a 1998 graduate whose performance credits include pop icon Beyoncé's all-female touring band and five albums as a bandleader in her own right. "It's our obligation to uphold this tradition of African-American music. This is our legacy." Saxophonist Joe Jennings founded Spelman's jazz program in 1983 and was eventually able to offer courses including jazz improvisation, jazz composition and arranging within the music department. But the heart of the program was the Spelman College Jazz Ensemble, which Jennings directed for 30 years. "We played at the Schomberg in Harlem, at the New Orleans Jazz Festival, and at NJPAC," remembers alumna Donna Hope, an environmental consultant who graduated in 2000. "We opened for legends like singers Abbey Lincoln and Dee Dee Bridgewater, for violinist Regina Carter. We performed for alumnae chapter fundraisers and went into the recording studio to make a CD every other year. This was a serious mission." When Jennings retired in 2013, his replacement was short-lived. "If the person you hire fails at some level," Jennings comments, "do like you'd do for any other course and hire somebody else." Instead, the jazz band was quietly phased out during the 2016-17 school year. Representatives of Spelman College declined repeated interview requests for this story. By all accounts, jazz faced its share of challenges at Spelman even before Jennings' retirement. "With the cost of Spelman," Jennings relates, "most African-American families were not going to send their daughters to college to study jazz." Support from the administration for jazz could also vary from one Spelman president to the next. A jazz track within the liberal arts music major was designed, but never got off the ground. There were no scholarships for student recruitment, so Jennings had to recreate the ensemble each year from the comparatively small undergraduate population of 2,000 women. The instrumentation varied in an ensemble that could range from 12 to 18 students: a vocal trio, quartet, or quintet typically joined a mix of horns and a rhythm section. In response, Jennings penned arrangements for what could be unconventional performing forces, focusing each semester on the music of a selected master composer or performer like John Coltrane, Horace Silver, or Sarah Vaughan. "What he did was a labor of love," says Fuller, who paints a portrait of Jennings as a devoted teacher. "I first started practicing six to eight hours a day because of Mr. J. He'd say, 'Come on, Tia, let's play,' and we'd sit in the band room improvising back and forth. He always took time out of his day. And he's an amazing player." While the band produced talented performers like Fuller, opera singer Janinah Burnette and actress Karan Kendrick (Hidden Figures), most of the students went on to work in other fields after graduation. Jennings always saw the mission in broad terms: "We were exposing students to the culture. By allowing them to practice and improve, they could develop a deeper level of respect for the discipline and accomplishments of great artists. Jazz is arguably the most complex music that America has contributed to the world." He adds, "In my first years teaching, I sometimes had students whose grandfathers were involved in the music. Since then, most of the kids coming in have known nothing about it." As compared with other historically black colleges and universities, Spelman is not unusual in assigning jazz a peripheral role in musical studies. European classical music is at the center of its liberal arts music major, between the courses offered and its historic Glee Club. Starting in the 19th Century, black colleges developed spectacular choral groups. They toured, singing standard classical repertoire, spirituals, and what were referred to as "plantation songs" in places where whites audiences had never heard African-American folk music. It was an effective fundraising mechanism for the then-nascent institutions. "The philosophy hasn't really broadened in the last 50 years," Andrews continues. "The irony is that while the majority of other schools across the country have developed forward-thinking music programs, the black schools have not. They tend to be much more culturally conservative." Howard University's jazz track is perhaps the notable exception. The trumpeter Donald Byrd became its founding director in 1968, after students protested an exclusively European classical musical curriculum; campus practice room rules were so strict that some student musicians were expelled for using them to rehearse jazz. Spelman's jazz program might be revived even with limited resources, suggests Tia Fuller. A professor at the Berklee School of Music, Fuller has proposed an exchange program between the two schools. "It would be empowering for the women at Berklee to be at Spelman for even one semester and in a culture of black women who are very serious about what they do," says Fuller. Fuller and Donna Hope have joined with other alumnae to create a petition to save the Spelman College jazz program. While it's difficult to gage the interest of current Spelman students in jazz — students who have never had the benefit of seeing a leader like Jennings in action — a number of them have signed the petition. "Some kind of joint program would be ideal," says Andrews, citing Spelman's current dual degree programs in engineering, fields that are also heavily male-dominated. At the completion of his fellowship year, Andrews issued a set of recommendations for the future of the jazz program and submitted them to the administration, then headed by Dr. Beverly Daniel Tatum. "I thought that having a jazz program was a way that the school could really distinguish itself among places where students can get a great education and have a distinctive women's experience." There has been little response from Spelman, Fuller and Andrews say. Current president Mary Schmidt Campbell may have a different agenda in mind: the building of a new campus arts center. Not only does the role of jazz remain an open question in terms of this new site, but that of the school's entire music department. "Dr. Campbell has a long legacy of being invested in the arts," says Hope, citing Campbell's past positions as the dean of NYU's Tisch School of the Arts and executive director of the Studio Museum of Harlem. "This is a person who understands the arts. How can she not understand the importance of the jazz program? It's left us scratching our heads."